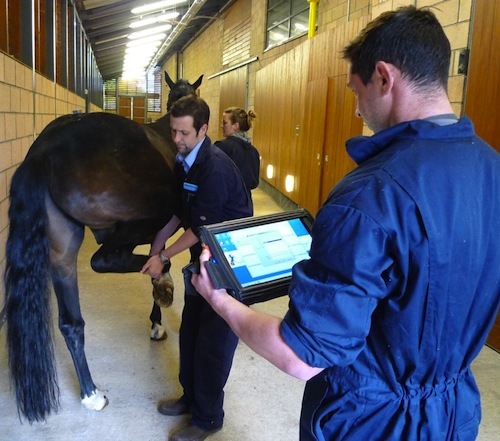 Flexion tests are used routinely in horses with subtle or imperceptible lameness, to exacerbate the problem and make it apparent to the observer. The test involves applying a short period of pressure to the joints of the limb before re-examination, and evaluating any change in gait. However, flexion tests rely on the ability of the observer to identify and interpret changes in the horse’s gait: in that respect, these tests are subjective and not necessarily consistent between observers. The research study was conducted by orthopedic surgeons based at the University of Glasgow's School of Veterinary Medicine. Seventeen healthy adult horses, all in work, were fitted with sensors before being trotted in a straight line. The sensors measured vertical pelvic movement asymmetry for both right and left hind limb strides and the average difference in maximum and minimum pelvic height between right and left hind limb strides. A hind limb was randomly selected for 60 seconds of proximal flexion, after which the horse was trotted for a minimum of ten strides. Response to the flexion was blindly assessed as negative or positive by an experienced observer. Information in this article was provided by the Equine Veterinary Journal. More: The paper, which was published at the end of last year, is currently available online as open access to be read in its entirety. The system tested was the Equinosis system, developed at the University of Missouri. Click here for ordering information; last copies of first edition available.